The Grandmaster Gem --- Solved! Way back in December, we presented Brian Hinkle's Grandmaster Gem --- a problem which up to that point had been solved by only two people, and had baffled many master class players. Since we published it, only one correct solution has been received; but there have been numerous pleas for help! We are at long last pleased to provide the solution, written and annotated by problem author and Checker Maven contributor Brian Hinkle. 1. 24-20 16-19 2. 23x16 12x19 3. 20-16 8-12 4. 9-5 22-18 5. 16-11 18-15 6. 11-7 2x11 7. 5-1 15x6 8. 1x10 19-23 Drawn. So Grasshopper, choose wisely: would you rather have a man-up draw or would you have the courage to sacrifice 2 men and get a man-down win? B - Temporarily locking down Black's 4 pieces on 8, 11, 12, and 16. Note: after 2. 24-20, this setting makes a beautiful twin with the terms: Either to play, White wins. Can you see how White would win if it were White's move? In a 5 minute crossboard test, this fooled the only three solvers of the 6x5 above (Alex, Jim and Albert). If you can solve this twin, then you may understand the importance of "the move" in this ending. After you solve both problems, how would you explain to a checker student why the solutions are different? C - Black may as well chase the piece on 23 now and hope white moves 23-18? which would allow Black to draw.. Delaying with 22-17 will result in the same 2x4 cramp shown in the trunk line. D - White is now a man-down after sacrificing a second piece. Does this position look like a white win to you? It is, believe it or not! E - White gets the 2x4 bind regardless of where the Black king moves next. F - The 2x4 cramp + "the move" = man down win. In this position "the move" means the total number of pieces in the columns up from squares 29, 30, 31 and 32 will total 5 when it is White's turn. If White doesn't have "the move", then it is only a draw! G - White must crown the piece on 29 first. Starting the piece on 32-27 will allow Black to slip away with a draw with 18-22 7. 27-23 22-26 8. 23-18 26-23 9. 18-14 16-19 10. 7x16 23-18 11. 16x23 18x27... Drawn. H - Going into the double corner makes for a quick win...18-14 11. 9-6 14-9 12. 6-1 9-5 13. 1-6 5-1 14. 6-10 1-5 15. 32-27 5-9 16. 27-23 9-5 17. 10-14 5-1 18. 7-10 1-5 19. 10-6 5-1 20. 6-9 1-5 21. 14-18 5x14 22. 18x9 White Wins. I - White must park the second king here on square 6 so a winning swap can be threatened later as the piece on 32 moves up the board to crown. J - With the White king placed on square 6 it is now time to get a third king. K - If 26-23, 6-10 is the important swap that White needs to threaten. L - Same as Ben Boland's Famous Positions p.135 after the 3rd move, colors reversed. Although not mentioned by Boland, it is important to note that if it were Black's turn, then it is only a draw. Having the 4x2 bind is not enough to win. Again, note that there are 5 pieces in the winning side's system ... a high five to the winner! M - The only move to win. N - 42. 27-32 18-15 43.11x18 20-4 44. 12-16 4-8 45. 18-22 8-12 46. 16-20 24-19 47. 32-27 12-16 48. 27-32 19-15 49. 32-27 15-18 White Wins, Famous Positions, colors reversed. 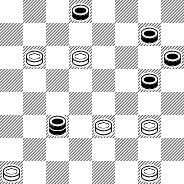 This checker problem was created after I noticed that the early 23-18 Switcher game between Alex Moiseyev and Louis Cowie played at the 2002 Ohio State tournament could have resulted in a strange man-down position. Later, I noticed this was the Fugitive King win in Famous Positions and I mentioned this to Rich Beckwith; it was an observation I made when I was going through a period without using any computer software. Fascinated with this discovery, I decided to find the earliest possible setting of the Fugitive King win and then disguise it in a natural setting where 2 men must be sacrificed in order to get the pretty man-down win. It took about 10 hours of work to set it up just right after I understood everything, including "the move", using KingsRow. Back in June 2004 none of the checker programs with the 8 piece database could solve it so many players assumed it was a draw! Ed Gilbert confirmed it was a win with KingsRow's 9 piece database. I congratulate the only 3 players in the world who solved it: Alex Moiseyev, Jim Morrison and Albert Tucker. 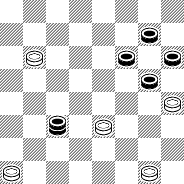 Almost everyone else thought this position was set up wrong, especially players who used checker software with the 8 piece database. This underscores a growing dependency on computers. It turns out that computers were not needed to solve this puzzle at all and in this case they just got in the way. The main thing you needed to solve this puzzle was knowledge of the Fugitive King win published in Ben Boland's Famous Positions. 1. 11-15 21-17 2. 9-13 23-18 3. 8-11 25-21 4. 6-9 27-23 5. 1-6 32-27 6. 3-8 30-25 7. 9-14 18x9 8. 5x14 24-19 9. 15x24 27x20 10. 6-9 22-18 11. 13x22 26x17 12. 11-15 18x11 13. 8x15 17-13 14. 4-8 13x6 15. 2x9 31-26 (Louis Cowie played 25-22? against Alex Moiseyev in the 2002 Ohio State tournament and lost.) 16. 8-11 26-22 17. 15-19 23x16 18. 12x19 22-17 19. 9-13 25-22 20. 11-15 20-16 21. 19-24 28x19 22. 15x24 (Left as a Black win in Master Play p. 351-P. Black will use knowledge of the Fugitive King ending to complete the win. From this point on, there is no draw escape for White.) 16-12 23. 24-27 12-8 24. 27-32 8-3 25. 32-27 3-8 26. 27-24 8-3 27. 24-19 3-8 28. 19-15 8-3 29. 15-11 29-25 30. 11-15 3-8 31. 15-19 8-3 32. 19-23 3-8 33. 23-26 8-3 34. 7-11 3-7 35. 11-16 7-2 36. 16-20 2-6 37. 14-18 6x15 38. 18-23 ... Black Wins. 1. 11-15 22-18 2. 15x22 25x18 3. 8-11 29-25 4. 4-8 24-20 5. 12-16 28-24 6. 10-15 26-22 7. 9-14 18x9 8. 5x14 31-26 9. 8-12 23-18 10. 14x23 26x10 11. 6x15 21-17 12. 1-5 17-14 13. 2-6 32-28 14. 3-8 14-10 15. 7x14 27-23 16. 5-9 24-19 17. 15x24 28x19 18. 9-13 22-18 19. 6-9 25-21 20. 13-17 30-26 21. 9-13 18x9 22. 17-22 26x17 23. 13x22 9-6 White Wins. If you enjoyed this problem, then let me know. If you have any additional run ups or associated positions to share, then please email me at sbhinkle@charter.net. Due to the complexity of this solution and the many variants and runups, we haven't attempted to provide animations. We recommend that you click on the Printer friendly version legend below, print out a copy of this article, and enjoy it at your leisure in front of your checker board, with your favorite beverage at your side.